Perhaps one of the most obvious changes in the final rule is an adjustment in timing. In the proposed rule, the first year in which states have compliance obligations was 2020. In the final rule, this first date of compliance has been pushed back two years to 2022. 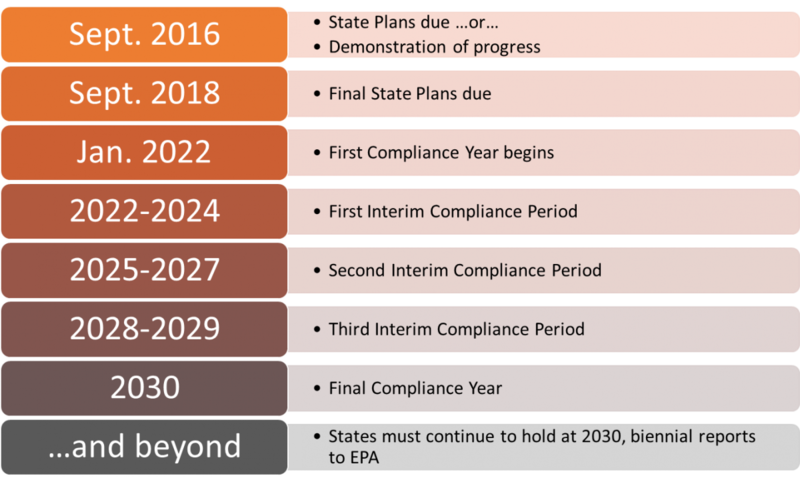 States are still expected to comply during an interim period through 2029, and must meet a final compliance deadline in 2030. The final rule also establishes “glide paths” that gradually step down each state’s compliance target over the course of three interim compliance periods in order to better reflect commenters’ suggestions about states’ ability to phase in emission reduction measures. In our series of reports on the proposed Clean Power Plan, Synapse explained three “moments” in which rate (tons per MWh) or mass (tons) limits having meaning: target setting, plan development, and compliance. Target setting has already been completed by EPA. EPA rate and mass emission limits for each state are available at http://www.epa.gov/airquality/cpp/tsd-cpp-emission-performance-rate-goal-computation-appendix-1-5.xlsx. Plan development commences immediately. States’ draft compliance plans or demonstrations of progress are due September 2016, and their final plans are due September 2018. During this moment, states may follow the approaches outlined by EPA in its target setting, or may design their own strategies to comply with the targets. For most compliance options, states must demonstrate through modeling that their plan achieves an emission rate or mass equal to the target set by EPA. Compliance is the retrospective evaluation of what emission rate or mass has actually been achieved and whether it is equal to or below both states’ plans and EPA’s targets. States will need to demonstrate their compliance in 2024, 2027, 2029, 2030, and biennially thereafter. Heat rate improvements at coal units have been reduced and differ according to where power plants are located. Natural gas combined cycle (NGCC) redispatch, or increased generation from natural gas combined-cycle units displacing generation from coal, has been modified. This is now calculated based on a different level of peak generating capacity at these units, and an assumption that they can operate at a 75 percent capacity factor level, rather than at 70 percent. Nuclear generation from either at-risk or under-construction nuclear power plants has been removed from target setting. Renewable energy is now based on total potential availability, rather than on regional renewable portfolio standards. Energy efficiency savings are no longer included in target setting. Displacement of fossil resources by renewables is now accounted for in state targets. The target calculation itself is now largely done at the interconnect level. Said another way, EPA divides the contiguous 48 states into three regions: Eastern, Western, and Texas. EPA then determines the level of heat rate adjustments to coal units and levels of incremental NGCC generation and renewables possible in each of these three regions, and calculates target rates for coal and NGCC units. The least stringent of these rates is then selected, and applied to each of the states. 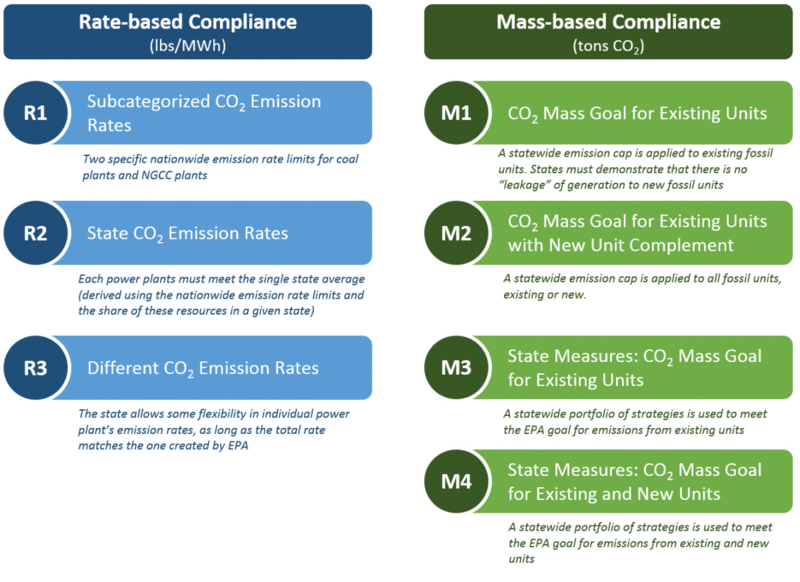 EPA has increased the number of compliance pathways from two (rate- and mass-based targets) to seven, as shown in the figure below. Unlike in the proposed rule, states no longer have the option to do their own rate-to-mass target conversion. States have the option to create compliance plans that fall into one of these seven approaches, and meet the specific target developed for that state under that approach. EPA calls out approaches “R1” and “M1” as “Model Rules.” These two approaches are the federal plans that EPA will enforce if states do not submit state plans or do not meet their selected approach. EPA is encouraging states to consider these approaches favorably. In the proposed Clean Power Plan, savings from energy efficiency and at-risk and under construction nuclear generation are included in EPA’s calculation of state rate and mass targets. In the final rule, neither efficiency nor nuclear generation are considered in target setting. However, energy efficiency is a viable option to use in plan development and compliance. With rate-based compliance, efficiency can be included as a reduction to both tons and MWh, but it will require measurement and verification of the efficiency savings, and trading mechanisms to buy and sell efficiency credits. With mass-based compliance, energy efficiency can still reduce emissions from fossil generation, and measurement and verification of the efficiency savings from specific programs is not necessary for plan compliance. Similarly, at-risk and under construction nuclear generation is no longer included in each state’s target calculation. However, states can still use new nuclear units (or increased generation from existing nuclear units) as part of their compliance strategy. The final Clean Power Plan targets account for generation and emissions displaced by renewables generation. This means that for every MWh produced by renewables, an equivalent amount of generation and associated emissions are subtracted from the calculation. In the proposed rule, this displacement was ignored in target setting—this change more accurately reflects the actual operation of the electric system. In target setting, coal and NGCC generation are displaced according to their share of generation. For example, if an interconnect has 100 MWh of renewables added to it, and the interconnect is made up of 75 percent coal generation and 25 percent NGCC generation, then 75 MWh of coal generation will be displaced along with 25 MWh of NGCC generation. In rate-based trading, the Clean Power Plan allows for a commodity called “Emissions Rate Credits” (ERCs) to be traded. These credits are measured in MWh and are added to the denominator of a state’s pounds-per-MWh rate calculation. ERCs can be produced by energy efficiency, renewables, new nuclear generation, or from incremental capacity uprates at existing nuclear, hydro, and NGCC power plants. In mass-based trading, the traded commodity is emission allowances measured in tons. These allowances largely align with current allowance-based cap-and-trade systems such as RGGI. Note that mass-based states cannot generate and sell ERCs to rate-based states, unless there is a contract in place in which electricity is sold directly to rate-based states (for example, if a wind farm is located directly across a state border and is directly tied to the rate-based state’s grid). Under the final Clean Power Plan, EPA is allowing generation or emission reductions that occur over and above a given state’s target to be carried forward—or banked—and applied to a future year. These banked ERCs or allowances can be applied to any future years, without limitations, encouraging states to meet their more stringent later-year targets in early years. Furthermore, under its banking system, EPA will allow states to count ERCs and allowances from 2020 and 2021 toward compliance in 2022 and later years. This “Clean Energy Incentive Program” gives bonus ERCs and allowances to states that invest in renewables and energy efficiency implemented in low-income communities before the first compliance deadline. Under this program, generation from renewables are given a single ERC or allowance, while savings from energy efficiency is given two ERCs or two allowances.